Hello! It's time for another Fun Friday at Your Next Stamp! Today I made another fun ornament box! I am trying to make several of these for teachers/friends this year:) This is the first time I've inked up this adorable Christmas Bauble Robin and I LOVE IT!!! Such a fun image! 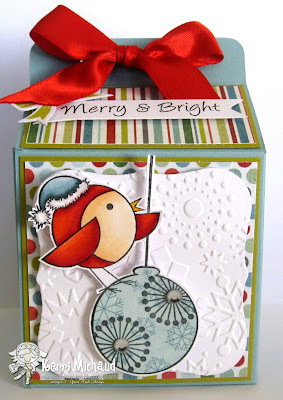 I don't have a lot of time because my mom and bestie are waiting on me to hit the stores, but make sure you check out the Your Next Stamp Blog for more fabulous Fun Friday projects! Thank you so much for stopping by and happy shopping/stamping! What a gorgeous box Kerri.